A few days ago I visited the Koninklijke Bibliotheek (Royal Library), situated close to Den Haag’s Centraal Station. While approaching the building from the south you can see that the two parts of the building’s name have cleverly been magnified as a sort of holographic metamorphosis on the triangularly curved side of the building. How fully in line that will appear with the book I was looking for that day will become clear further on in this blog. The Koninklijke Bibliotheek is the largest and most extensive library in the country with more than 2,5 million books and a nearly 50 km of total shelf length. 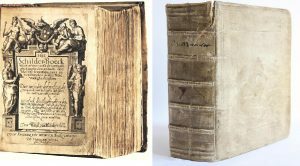 Its huge collection contains everything published in The Netherlands since the invention of book printing – and even many older manuscripts as well. This is the place to be if you are looking for any Dutch book. The purpose for my visit was to take a closer look at one specific book. Published in Haarlem for the first time in the first decade of the 17th century, het ‘Schilder-Boeck’ (The Book Of Painters) immediately reached the status of what might be called ‘the painter’s bible’, not only for 17th century artists, but basically for anyone in those days who was interested in the noble art of painting. The book consists of six parts and is, up until today, the principal source on the lives of painters, art history and theory in the 15th and 16th century Dutch (and even German) speaking countries. Although the book became an instant bestseller in the Low Countries, its Flemish born writer Karel van Mander unfortunately never made it to enjoy the success of the many reprints, because he died within two years after the first publication in 1604. 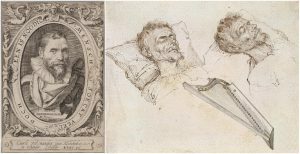 His colleague painter Jaques de Gheyn II saluted the admired master with this sagacious drawing of him on his deathbed, where we can almost hear the ascending harp tones in his honour. Karel van Mander’s ‘Schilder-Boeck’ provides us not only with summary biographies of many illustrious painters, like the one here described as ‘een seer konstigh dapper Conterfeyter nae ‘t leven’ (a very artistic and brave Conterfeyter after live), but was also the first publication in the Dutch language of Ovid’s most admired narrative poem. The fifth part of the book is titled ‘Wtlegghingh op den Metamorphosis Pub. Ouidij Nasonis’ (Commentary on the Metamorphoses of Publius Ovidius Nasso). In the religiously and politically rather divided Low Countries of the time it had become fashionable to choose politically correct subjects such as stories too old to be offensive to either Protestants or Catholics. For the new generation of ambitious painters this fresh translation of the ancient Metamorphoses provided a gold mine for the subjects of their paintings. In Leiden, the young Rembrandt would undoubtedly have had a copy of the Karel van Mander’s ‘Schilderboeck’ on his bookshelf.